In doing my research prior to writing this review I discovered that Kerry Conran originally wanted to do this movie with unknown actors and break it up into ‘chapters’ and present it as if it were a lost serial from the 1930’s that had recently been discovered. I would really have liked to see that version of SKY CAPTAIN AND THE WORLD OF TOMORROW since I think he could have pulled it off. As anybody who’s read my work knows, I’m a full out geek when it comes to the blood and thunder pulps of the 1930’s and 1940’s and Saturday morning serials and 90% of my work is written in the tradition of the pulps. As I watched SKY CAPTAIN AND THE WORLD OF TOMORROW I realized that I had a spiritual brother in Kerry Conran. I don’t often recommend that people see a movie just for the way it looks but SKY CAPTAIN AND THE WORLD OF TOMORROW is one of those movies. It’s an out-of-body experience that truly takes you into another world and despite what I think are some flaws that prevent it from being quite as good as such great pulp inspired films such as The Indiana Jones movies “The Rocketeer” “The Phantom” and “Buckaroo Banzai” it’s an astounding adventure movie that proves what I’ve been saying for years: pulp action adventure is alive and well and if presented in the right way, people will eat it up. The look of the movie is achieved through the means of almost total CGI. Except for the actors, their costumes and some of the sets, nearly everything else is a digital creation and the results are simply astounding in evoking a 1939 that only existed in the pages of pulp magazines and serials and could only be realized now. There’s a certain irony in the fact that the best way to visualize a world of the past is by means of a futuristic technology but it works. Boy, does it ever work. SKY CAPTAIN AND THE WORLD OF TOMORROW takes place in an alternate Earth where the Second World War has apparently never happened. We can tell that right from the beautiful opening sequence where The Hindenburg III docks at The Empire State Building. That huge tower on the top was designed exactly for that purpose in our reality but after it was built it was discovered that the high winds would make dirigibles move around too much and make it impossible for passengers to disembark. But in this world they’ve obviously overcome that problem. Aboard The Hindenburg is Dr. Vargas (Julian Curry) who is on the run from sinister forces who have been kidnapping the world’s leading scientists and he’s next on the list. He’s come to New York to warn his colleague, Dr. Jennings (Trevor Baxter) who in turn contacts the crack reporter of The New York Chronicle, the wonderfully named Polly Perkins (Gwyneth Paltrow) and informs her that he was once a member of a mysterious group known as Unit 11 who worked for a Doctor Totenkopf (Sir Laurence Oliver in archival footage) on projects that were “too horrible to speak of” It’s during their meeting that New York is attacked by an army of giant flying robots that proceed to steal the city’s generators. 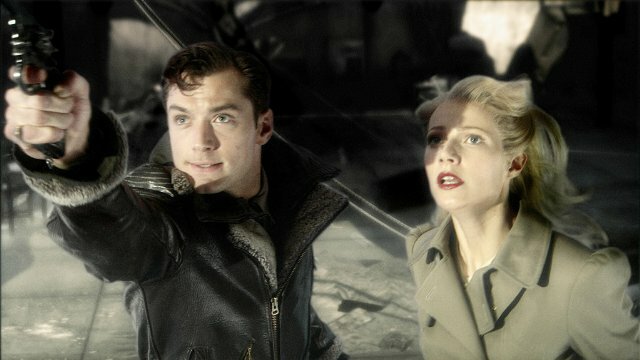 There’s only one chance for the city to survive and the call goes out for Joe Sullivan aka Sky Captain (Jude Law) to come and save the day in his customized, pimped-out P-40 Warhawk which he does in a breathtaking sequence that sets the tone for the rest of the movie. Turns out that Sky Captain is the only hope to find out where these giant robots are coming from and why they’re attacking cities all over the entire world for their generators. Sky Captain is ably backed up by his own private army and his faithful sidekick, Dex (Giovanni Ribisi) who judging from his speech patterns and technological genius must be an ancestor of Stark Trek’s Mr. Spock. Polly insists on going along the adventure and it turns out that she and Sky Captain had a wild romance in the past that resulted in her sabotaging his beloved plane. That led to him being held in a prison for six months so there’s a certain amount of friction there that leads to some entertaining banter between the two as they go off on a world-wide quest for Tontenkopf’s secret base to stop his mad schemes. They’re followed by The Mysterious Woman (Bai Ling) who is Totenkopf’s enforcer and seeks to stop them. 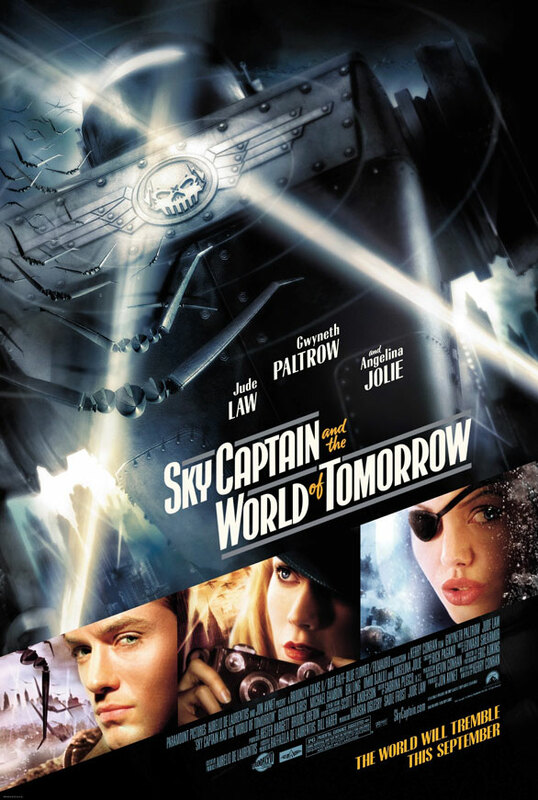 Along the way Sky Captain and Polly get the help of Franky (Angelina Jolie) the eye patch wearing commander of a fleet of aerial aircraft carriers and they assault Dr. Totenkopf’s island fortress in a last ditch effort to save the world. SKY CAPTAIN AND THE WORLD OF TOMORROW is a great movie for those of us who love the pulps and those of us who have no idea of what the pulps were and want to know. Jude Law, Gwyneth Paltrow and Angelina Jolie do an absolutely bang-up job in their roles and considering they were working on sets where they had to imagine what they were seeing, they do a great job. 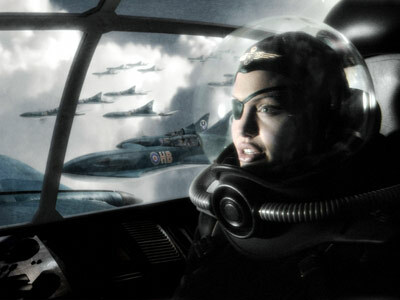 I really liked Angelina Jolie’s work in this movie and I bet if you ask her she’d admit that she’s a fan of Jim Steranko’s “Nick Fury, Agent of S.H.I.E.L.D.” since her role is practically a 1930’s female version of that character. There’s a fantastic scene where she and her squadron of ace pilots dive into the ocean and we see that their planes can also become submarine fighters that had me jumping up and hollaring like a maniac. And I won’t even tell you the scene that happens after that when she has to take out a giant robotic crab monster protecting Totenkopf’s island. Another thing that had me puzzling over is that early in the movie it’s said that the nations of the world have to rely on Sky Captain and his private army to find Totenkopf since their armies are engaged in other conflicts. Well, if in this world there’s no World War II then what conflict is going on that would prevent the world powers from sending their armies after Totenkopf? And I also didn’t like how near the end where Sky Captain and Polly have been busting their asses to save Dex for nearly 30 minutes of the movie’s running time Dex shows up to save them and he explains how he escaped in an unconvincing offhanded manner. And the movie doesn’t have the headlong adrenaline rush of the Indiana Jones movies or “The Rocketeer” or “The Phantom”. It’s a good movie, don’t get me wrong but I have the feeling that the director is more in love with getting the look and feel of the movie right more than the action elements. But when we do get action, it’s worth the wait. You just can’t beat the scene in New York with Sky Captain fighting the robots and that simply incredible underwater scene with the amphibious planes. Stuff like that is what a pulp fan like me lives for and I certainly got it. But there’s a curious lack of headlong action that doesn’t carry you along in a rush that I attribute to the director. Kerry Conran is good, yeah, but he’s not a major action direction who could have torn up the screen with material like this. The performances in the movie are also worth mentioning. SKY CAPTAIN AND THE WORLD OF TOMORROW was part of the Jude Law Film Festival of 2004 where it seemed as if every other movie that hit the screens that year starred Jude Law. He’s really good in this one as he plays it absolutely straight. His daredevil pilot Joe Sullivan would have been right at home in a Howard Hawkes movie like “Only Angels Have Wings” and I loved how during the underwater fight scene Angelina Jolie grins like a kid on Christmas while wearing a helmet I’m positive was inspired by Wally Wood. So should you see SKY CAPTAIN AND THE WORLD OF TOMORROW? Without a doubt. It’s an excellent movie simply on a technical level in that it brings to life a world of pure pulp adventure. I would advise you to see The Indiana Jones movies or “The Rocketeer” or “The Phantom” if you want to know what the action and energy of the pulps and Saturday Morning serials felt like but see SKY CAPTAIN AND THE WORLD OF TOMORROW if you want to know what the pulps and Saturday morning serials looked like. Great review. It’s always nice to come across someone else who appreciates this movie. I saw it in the theater when it premiered, and after watching it the first time, I immediately bought another ticket so I could see it again. I wish we could have had a sequel. Pretty much agree with you right across the board, Derrick. Great review. I never saw SKY CAPTAIN until I bought it for $3 out of a bargain bin, but I really like the movie, flaws and all. It’s kind of like what I was saying in my review for ESCAPE TO NEW YORK and you mention it here – I feel like Conran is that “spiritual brother,” as you call it, and that allows me to admire the look and feel and attempt of the film beyond its recognizable flaws. The first time I watched this movie I couldn’t believe how awesome it was even with those flaws.